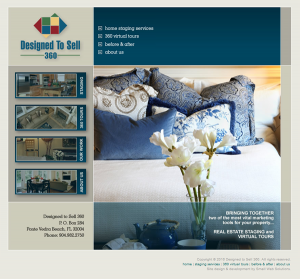 Site Features: Informational site for a home staging and virtual tour enterprise in Florida. Includes a before & after photo gallery as well as downloadable informational brochures. PayPal checkout incorporated into website for payment of fees. Design Features: Unique use of swap menu images on home page and throughout; page templates for swift page addition and global updates; automatic copyright updating.